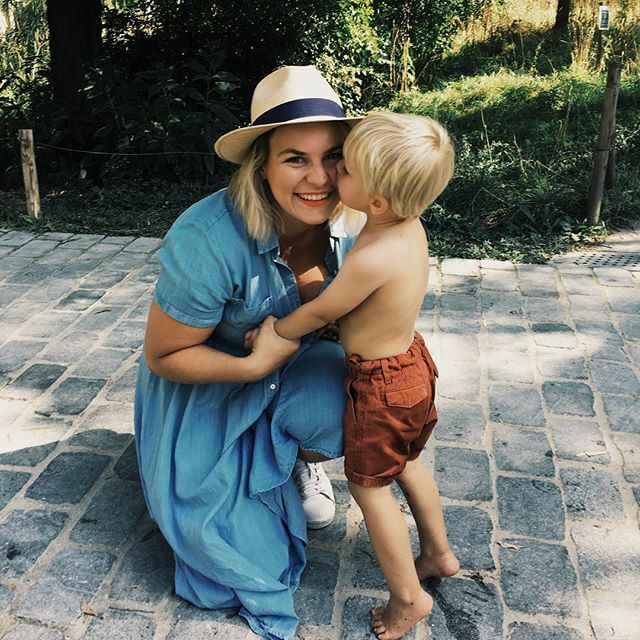 I’m Sophie, I’m originally from the south east of England but I moved to Paris when I was 21 as an au pair and have been here for nearly 8 years now. I’m married and have two sons, Arthur who’s three and a half and Fred, who is one. We still live in central Paris and love the area we live in. I’m the founder of Nourish Paris, which makes and delivers food packages to new mums and families in the Paris area. At first it was out of necessity. We were young and didn’t have an income that meant we could afford something bigger. Paris is a pretty expensive city and small and cheap was our only option. However, now we’ve been doing it for so long, I don’t think I could live any other way. When we’re in my parents house or at my in-laws, I almost feel overwhelmed by the space. Now I enjoy the feeling that living purposefully small gives us - less to clean, less possessions, less opportunities for my kids to make mischief! But seriously I love that I can generally always see and hear my kids. They can close their bedroom door if they want to play quietly alone and at night they’re used to sleeping with the sounds of other people nearby. The “essentialism” that comes along with living small was originally difficult to adapt to, particularly for my husband who likes to keep sentimental items but we’re on a constant learning curve, really adapting to family life as our kids get bigger. Now I’ve read so much and learned so much from people I’ve followed since the beginning, I know the benefits of what we’re doing. For us and our health, our kids, the environment, everything points to this being the right choice for us. Is it common for families to live small in Paris? I’d say that it’s becoming more and more common for families, yes. The large apartments just aren’t coming up for sale and are really very expensive and out of the price range of lots of families. We’re on the smaller side of our friends but I don’t really know many people in apartments much bigger than 70-100m2 (approx 100 1000 square feet). I’m not sure that it’s become a movement of small space living as such because, well pretty much all the apartments here are tiny by American standards! People are used to living in close quarters here! Oh I’m not sure! I sort of just worked with what we had and discovered my own style at the same time. I’d say that I try to be minimal but I’m too much of a random object collector for that. Plus the kids seem to accumulate clutter faster than I can donate it! Actually one of our new year's resolutions is to make the apartment look a little more purposefully decorated than thrown together. We’ve really just started understanding our own style and what we like so we’re excited about slowly improving the way our apartment looks and functions! A fold out dining table. I read something years ago from Erin Boyle on Reading My Tea leaves that really resonated with me - working out your family’s priorities is vital to small living. One of our priorities is cooking and eating together as a family, so I always wanted a super functional kitchen and dining table. We also have a kids sized table and chairs where both boys can sit and eat if I’m intending on eating later. Often they’ll sit there while I cook and do play doh or some painting or just play. It’s made our kitchen much more family friendly than it was and we all enjoy being in there. I also love our bed - we considered a Murphy Bed when we first moved in here as we have the perfect place for it, but in the end we decided to keep our huge iron rung bed and I’m so glad we did. We’re lucky to have a large(ish) living space and, although it takes up a lot of space, having a bed out all the time almost splits the room into living and sleeping areas. It’s certainly helped how I feel about the space and I love the way it looks. The upkeep! Tiny spaces mean less work for everyone. I LOVE that it takes me half an hour to clean from top to bottom, an hour if I’m doing a really deep clean and changing sheets etc. I LOVE that our family works in a slightly different way to other families because we have to respect each other's spaces in a more intentional way. I like that my kids are growing up with an understanding of the value of things because we’re intentional about what we bring into our home. I like the way that we have a lot more free time because we don’t have a large property to maintain and the freedom that brings. If I’m honest, sometimes I hate the noise. I am someone who likes silence and my own company. In this, I’m lucky that I work from home during the day while everyone else is at school, creche and work and can carve out my silent time then. When I worked full time in restaurants and offices, I really struggled with the noise levels at home when I couldn’t excuse myself to another room and wind down in the quiet. So I’d say noise levels and the constant struggle in finding places to hang out wet laundry in the winter! It’s tough but I have to admit that letting go of certain standards of behaviour helps. Jumping on the beds and couch is more acceptable than usual, throwing pillows around, “outside voices” - much to my dismay! We do also have a Wobbel board and another balance board, a fabric covered exercise ball and an indoor tent along with lots of cushions and blankets for fort making and active play. Winter is probably one of the hardest times of the year for us as a family but it’s more than manageable when you accept that the kids will be finding the long nights and being cooped up a bit difficult. I think so. If we moved it would be for another bedroom, so another 10 - 20m2. We’re lucky that our space is so functional as lots of Parisian apartments are quite badly laid out - long corridors, lack of storage space and closets etc. I think if we intended on staying a lot longer I’d consider putting in some more storage options but overall I like the way we interact as a family in our small space. I think Small Space-ers need to stick together and share all their best tricks. Do you have any storage or organizational tips you want to share? Not an organizational or storage tip but more of a mindset one. I think it’s important to forget everything that society tells you that you need as a family. It’s so easy to see the “normal” lives of those who live in larger spaces - they’re represented everywhere and a large living space is still seen as a marker of a successful life. We’re told having and raising children requires space, for children to have their own rooms, a play room, a family bathroom and a parent’s bathroom - that we need more and more things to fill our spaces. None of this is true. Thanks so much for sharing your home here, Sophie. Your positive energy is contagious and made me feel refreshed about our own space. If anyone else is interested in sharing their home here please send me a message.